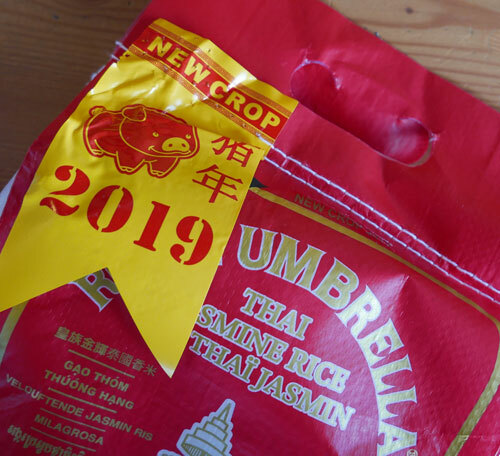 Our New Crop 2019 Thai Jasmine Rice was just received this week--notice the bright yellow New Crop 2019 with Year of The Pig on every bag. It is fragrant and packed ot the highest export grade. Royal Umbrella brand is truly a premium product. Appreciated by connoiseurs for it's deep fragrance and nice texture. Thai jasmine rice is recognized around the world as having the finest quality--it's Thailand's principle export product. Jasmine rice was developed years ago in Thailand. The agricultural name is "Khao Dawk Mali 105", rice with a distinctive jasmine scent, also known locally as Khao Hom Mali. Khao means rice, Dawk means flower, Mali means jasmine. We think you will agree that there is no substitute for original Thai jasmine rice, and we recommend serving all Thai dishes with Thai rice. The brand we ship is Royal Umbrella. It has fantastic aroma, consistency, and we regard this among as the best Thai jasmine rice exported from Thailand. Easily prepared using an electric rice cooker. You can also steam jasmine rice the traditional way--see our street vendor video for a great example. We are pleased to ship it to you for a competitive price. Product of Thailand. 10 lbs of rice is about 25 cups. We also offer brown jasmine rice , broken rice, sticky rice, and red cargo rice. Rice is grown throughout Thailand in large flat fields which become brilliant green as the rice paddy matures before harvest. Some regions provide for harvest of jasmine rice twice yearly, other areas can support a harvest just once per year. The pictures below show a small organic rice paddy a short time before harvest. White jasmine rice is produced by first harvesting the paddy, and separating the rice grain from the outer shell. Traditionally, removing the shell was done with hand tools such as a krok som mue, striking the rice with a long wood mallet as it sits in a large wooden bowl, then sifting out the bran to get a nice polished white grain. Nowadays rice is processed in a modern milling machine, which cleans the rice first, removes the shell, polishes the rice, sorts it and puts in a bag using a sequential operation. There are no additives, no chemicals, whiteners or anything else added to the rice. In recent years, more people are consuming brown jasmine rice, which is identical to white jasmine rice except that it has not gone through the final polishing stage which removes the thin, brown outer membrane. We offer brown jasmine rice, which has higher vitamin & fiber content, and requires a bit more water and time to cook. Brown jasmine rice is also a bit more crunchy, but has a similar taste overall. We also offer red cargo rice, Thai sticky rice, and black sticky rice. New: watch our Bangkok street vendor video featuring fried rice. Rinse the rice and put it in the rice cooker, then pour water over the rice so that the water is exactly one knuckle of your index finger over the top of the rice. Close the rice cooker and push the Cook button, it will be done in 15 minutes or so. There really is no need to use measuring cups, this is a fool-proof method for any amount of rice you're cooking. We love mixing varieties of rice, and find this trend growing among restaurants who typically mix a small quantity of red or brown. Here, we mixed 1/3 each. Follow the same instructions above and cook in a rice cooker. The result is very nice as shown. A mix of soft, cooked white jasmine, and slighly crunchier red and brown rice grains. This is nice served alone or with any Thai Recipe of your choice. The red rice and black rice are always a bit crunchier (like al dente pasta), and the black gives the batch a slight purple color. Taste and aroma is excellent, so this rice is often served alone. Follow the same instructions above and cook in a rice cooker. This attractive, modern rice cooker redesigned in 2015 is all you'll ever need. Featuring a timeless "Spring Bouquet" flower design, and built of materials that ensure decades of performance. Built to last for decades, it's heavy-duty and works flawlessly using solid-state components instead of digital electronics. If all you care about is a perfectly-cooked batch of rice every time, this is the ultimate rice cooker. The 5.5 cup is approx 10 inches tall and 10 inches in diameter. The 10 cup version s approx 11 in. tall and 12 in. diameter. Simply add rice and water, close the lid and push the button. After about 20 minutes the rice is cooked and it switches to "keep warm" mode--the rice stays fresh and warm for hours. We love this as shown in picture below: mix a spoonful of Mae Pranom crushed chili with equal parts of fresh-squeezed lime juice and fish sauce. Then spoon this mix over steamed jasmine rice. This nice sauce can also be served as a dipping for grilled meat and sticky rice. Straight from Thailand, as fresh as can be and loaded with flavor. You could not ask for a better company than Mae Pranom to make this one. They are so focused on making real, authentic Thai food using the finest ingredients. The package says in Thai language it's "perfect for traveling with to outside of Thailand". Perhaps no four ingredients represent real Thai flavor as much as these, mixed to perfection by Mae Pranom. This is called "Namprik Thai Tae" which means Real Thai Namprik. There is a wide rang of uses, simply add it to anything you might be cooking (soup, stir-fry, marinade, dipping sauce, etc). Packed in a nice large glass jar, and one jar of this goes a long way. Ingredients: dried shrimp, dried chilli, vegetable oil, salt. Product of Thailand.